We just got back home last night from our two weeks in Europe that consisted of visiting Spain, Italy & France. This trip initially began with our friend’s wedding in Italy, followed by our Gal Meets Glam Collection August shoot in Paris. When finalizing the details of our travels, we realized we had a few days before the wedding that were open, so we decided to make a mini vacation out of it, hoping to visit somewhere new. We had been wanting to go to Spain for a while, with Cordoba on our radar this past spring. With too many work commitments, we were never able to make it happen, but when looking at convenient flights to Milan (where we were flying in to get to the wedding), we saw a direct flight to Malaga, Spain from NYC. And there was a direct flight from Malaga to Milan Bergamo so it was a super convenient option. After some quick research, we realized that Seville was only a short drive from the Malaga airport, so we began to plan our trip! We knew we only had a limited amount of time, three full days, so we wanted to make the most of it and stay somewhere convenient. 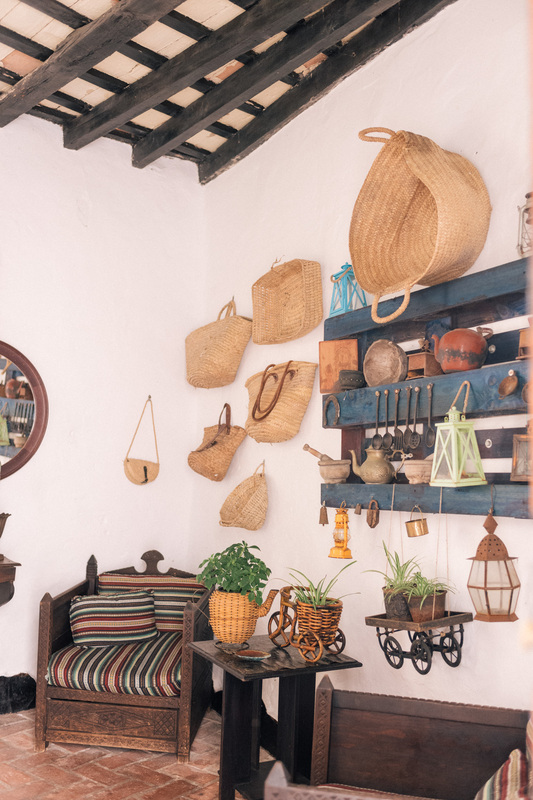 We found a charming small hotel, Hacienda San Rafael, that was only 35 minutes from Seville and perfectly located in the beautiful rolling hills of the Andalucia region. We flew from Charleston to NYC and then took a red eye from NYC to Malaga, Spain. We landed around 7am, picked up our rental car and started our journey to Hacienda San Rafael. It was still early in the morning when we arrived, but luckily we were able to check into our room, freshen up and start exploring. I often get asked how we manage jet lag when traveling and my best advice is to always try and stay on the time zone you are currently in. When you get on the flight set your watch to the time of the destination and force yourself to sleep as close to the schedule you’ll be on when arriving. Ear plugs, hydration and eye shades are incredibly helpful for this. Once you’ve arrived, instead of adjusting to the local time over a few days, try and get yourself to stay up and last as long as possible on the first day. We always find that if we can make it the first day, and go to bed at night (not still during the day), then our bodies adjust quickly. That’s exactly what we did in Spain. Even though we were quite tired from a red eye flight, we downed some coffee and headed out to visit some of the local towns. It also helps that we get an adrenaline rush fueled by lots of excitement of being somewhere new, so I refuse to rest. I like to soak in every bit of daylight when we’re traveling, from sunrise to sunset! 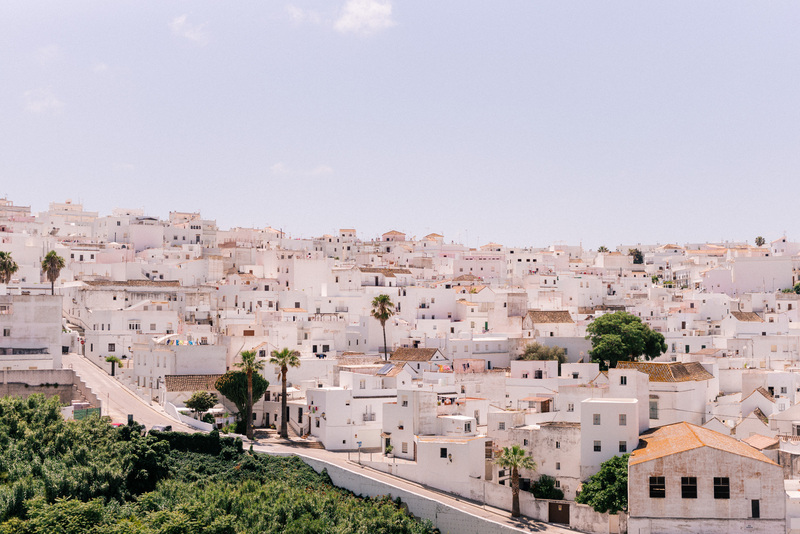 One of the towns we were most excited to visit was Vejer de la Frontera, one of the hilltop pueblos blancos of the Andalusia. The Adalusia region is filled with rolling hills filled with everything from orange orchards, sprawling olive tree groves and sunflower fields. When driving through the area, you’ll spot these all white towns sparkling in the distance. 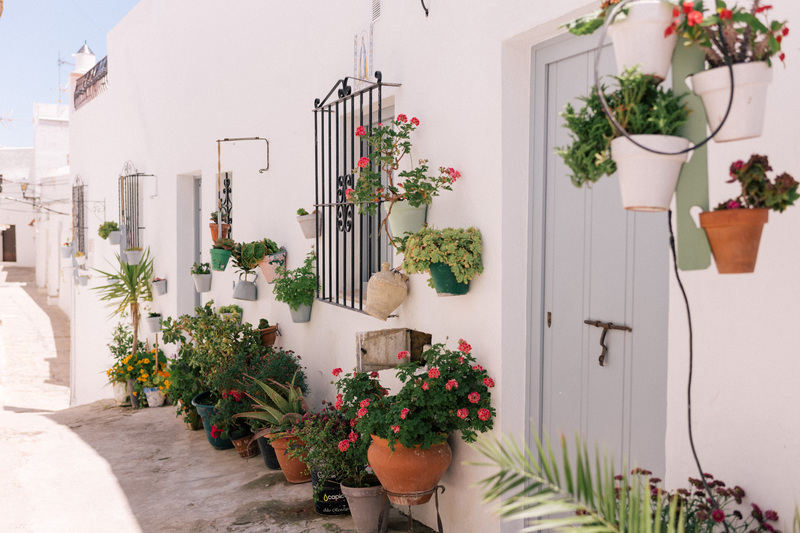 We heard that Vejer de la Frontera was one of the most charming ones and we were not disappointed. We arrived around 2pm to a sleepy and quiet afternoon with most of the restaurants and shops getting ready to close down for a siesta. We did what we do best, and that’s roam around the town, taking all of the back alleys and wandering into various public courtyards and open haciendas. The bougainvillea was in full bloom and almost everyone had their patios decorated with lots of colorful potted plants and mudejar tiles that we saw throughout our time in Spain. I was in complete inspiration overload and my camera roll on my phone is currently filled with images of these beautiful patterns and colors. We didn’t have any set plans or saved spots in the town, so we just let ourselves get lost and pulled into whichever direction drew our attention. After some time spent exploring the town and popping into small shops before they closed, we made our way over to El Jardin del Califa, a restaurant and hotel in the middle of town. To get to the restaurant, you have to walk through the beautifully decorated Spanish hotel, down a few sets of stairs and into a back alley that lead to an open stone courtyard where you can sit and have a leisurely lunch. Afterwards, we found ourselves heading up to their rooftop to check out the 360 degree views of Vejer de la Frontera and enjoying another shot of espresso to keep ourselves going. I saved a ‘Story Highlights’ of our Spain trip over on my IG, but have more coming this week, from our stay at Hacienda San Rafael to our time spent in Seville. I can’t wait to show you more of this beautiful trip! This is definitely one of my favorite outfits of yours! That skirt is breathtaking! I’m getting fiesta vibes from your outfit! So gorgeous. Your images are so pretty from Spain. It’s on my bucket list for sure! Looks and sounds absolutely amazing! Adore your skirt – perfect for the location! Looks like a beautiful trip! I LOVE spain – Malaga was one of my favorite places. It was so convenient to Seville and Grenada too! What a beautiful location! Spain is definitely on my list of places to visit, such beautiful country and culture! 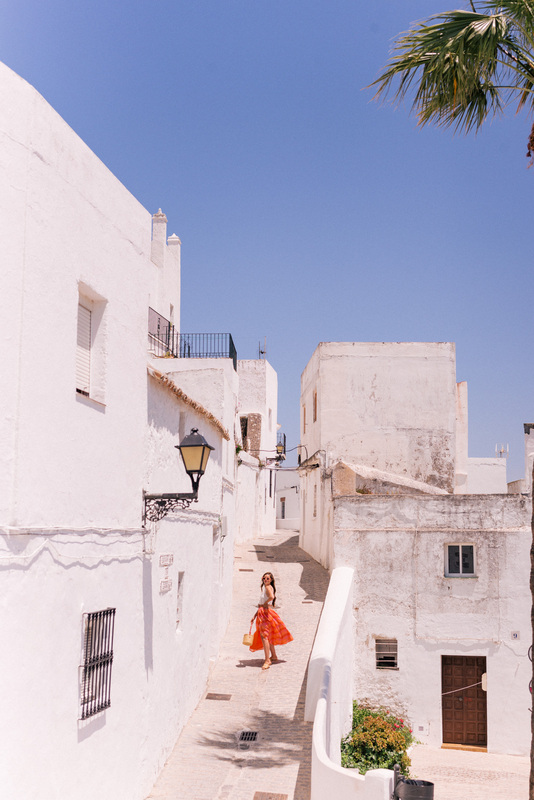 This is my favorite kind of post, when you go exploring and show us a new place to dream of traveling to and outfits that coordinate with the environment! All beautiful, thank you for sharing! You look amazing and so radiant. Spain is so beautiful, right?! This has given me so much wanderlust Julia! I love Spain, it’s such a beautiful country! It looks so beautiful! Spain is one of my favorite countries – it’s just so beautiful! Also, I adore the skirt you’re wearing! Great post! This area is gorgeous, and I love the all white architecture and styles. I can’t wait to read more about your adventures there! Such a gorgeous place to visit! I only made it to Barcelona for a few days but I’d love to spend more time in Spain. Looks like you and Thomas had a fantastic time. That sounds like such an incredible trip! All of your pics are gorgeous as usual. I love this outfit here and especially the accessories!! I was so looking forward to this post! When I saw on IG that you were in Vejer I couldn’t believe it. That’s my favorite pueblo blanco in all Andalucia! Even though I’m Spanish and I’m used to seeing them, I’ve always been fascinated by these white-washed villages. I live in Madrid but I try to escape south from time to time to see them. We just got back from Spain, but your trip makes me want to go back! We didn’t have time to see Seville, and now I know I must make it a priority to go! What perfect timing this post is, as we just puked into Casa la Siesta, a small boutique luxury bolthole only 10 km outside Vejer de la Frontera! After this we will be in Sevilla, so do post any Sevilla recommendations soon! It looks so pretty there!! I love these pictures. It sounds like a great trip! Your photos are so beautiful. Your travel posts are always the best, I can’t wait to see more of your Europe trip! And I am dying over that colorful skirt! Such a perfect color for a vacation in Spain. please do a hair tutorial again! your curls always look perfect! Looks like an amazing place! Perfect timing, I am looking for a summer destination. Thanks for sharing! This place looks gorgeous!! One question, what time of day did you walk around because it looks totally deserted! We just CHECKED in (not puked … seriously, what a gross autocorrect!) to Casa la Siesta! Your trip looks like an absolute DREAM! I adore small towns like this; I wish I was back in Europe! LOVE this outfit and the trip looked amazing! These photos are absolutely gorgeous!!!! So glad to see normal style posts again! I know your busy with all the GMG dresses but I am seriously just so inspired by your travel and style posts, I hope they never go away! Hi. so funny, I follow you on insta but do not remember seeing this. We are buying an apartment here, and came across your blog post in my research. So funny! Gorgeous pictures!! Any advice or other places to eat?